Media: Soft cover; 9" x 12" format; 180 pages plus covers; more than 300 photos and 63 colour profiles. Advantages: Superb collection of photographs, excellent colours and marking information, profusion of aircraft profiles and general arrangement drawings. The Pfalz Flugzeugwerke GmbH is best remembered for Oberingenieur Rudolf Geringer’s first design. It was the elegant D.III, a fighter that was to put the company on the road to success. Although it wasn’t a favourite amongst the leading pilots of the day, it did provide Pfalz with a dramatic increase in business. After years of making license-built aircraft for other manufacturers, they now were designing aircraft themselves. This book looks at the flying machines that carried the Pfalz name and this includes both copied and original creations. Consisting of 180 pages, this certainly is a very large book. It’s packed with over 300 black and white photographs, many that will be new to even the most ardent enthusiast. The oversize format of this publication allows the reader to gain maximum benefit from the printed images. Most are displayed two or three to a page so the level of detail available to the viewer is excellent. The captions are well thought out, the author choosing to provide the reader with additional information rather than repeating what is already in the text. Sixty three colour profiles are contained within the soft card covers, these being done by Bob Pearson and Alan Durkota. They encompass aircraft such as the various Pfalz parasols, monoplanes, D.III/IIIa, D.VII, D.VIII, D.XII, D.XIV, D.XVf, and of course the Dr.I. A colours and markings section explains the livery of these machines and this is in the form of copious notes contributed by Greg VanWyngarden. His knowledge on such matters makes him an ideal candidate in this area. To allow the reader a full understanding of the products from the Pfalz factory, 45 pages have been set aside for general arrangement drawings. Fifteen different aircraft are represented, these being in both 1/72 and 1/48 scale and are courtesy of Martin Digmayer. Apart from the above areas, the book is broken down into sections each focusing on a specific aircraft type. It starts off chronologically and features two-seaters, E-type fighters, early biplane fighters, and the D.III and D.IIIa series. Following are chapters on the Pfalz triplanes, rotary-engined biplane fighters, the so called “missing” fighters (Pfalz D.IX, D.X, D.XI), and finally the D.XII, D.XIII, D.XIV and D.XV. It is always interesting to compare the products from a single manufacturer. To have them all in a volume such as this makes fascinating reading. The collection of photographs is outstanding, the myriad of plans inspiring, and the colours and markings section revealing. 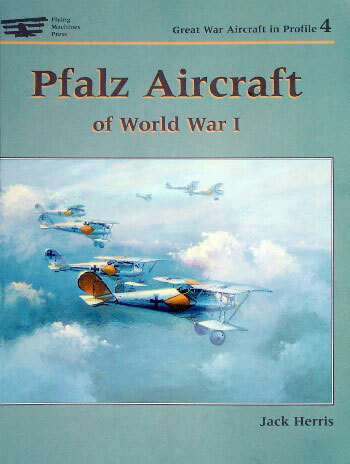 For an informative look at aircraft coming from the Pfalz factory, this book gives you one of the best overall views possible.